I can’t tell what the identity of this dish is. It is like a soup but it is not. 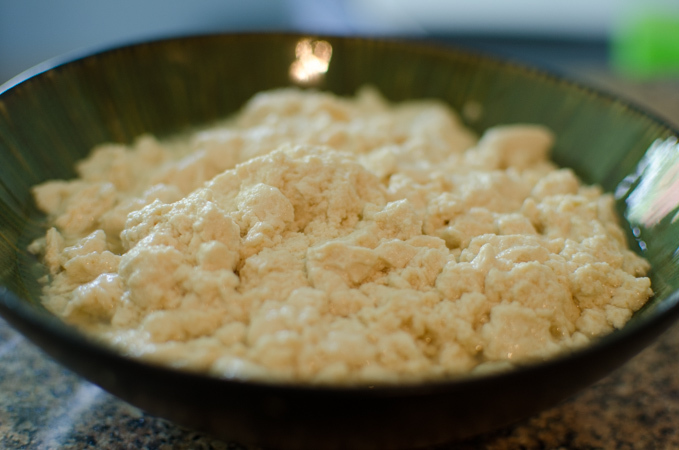 It can be a savory custard but doesn’t look like it. WTH, I will just call it tofu and tomato eggs. It surely is one of those easy-peasy comfort foods that doesn’t require much time and effort. 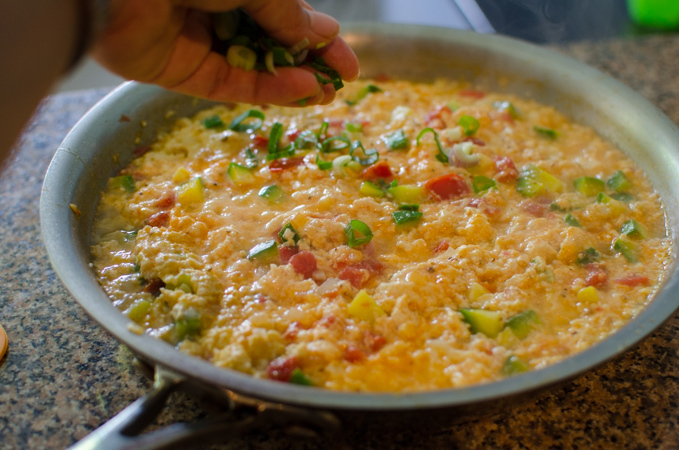 It tastes great served with rice as a simple meal. I enjoyed it when my heart was down and low. I hope you enjoy it, too. I smashed the soft tofu. 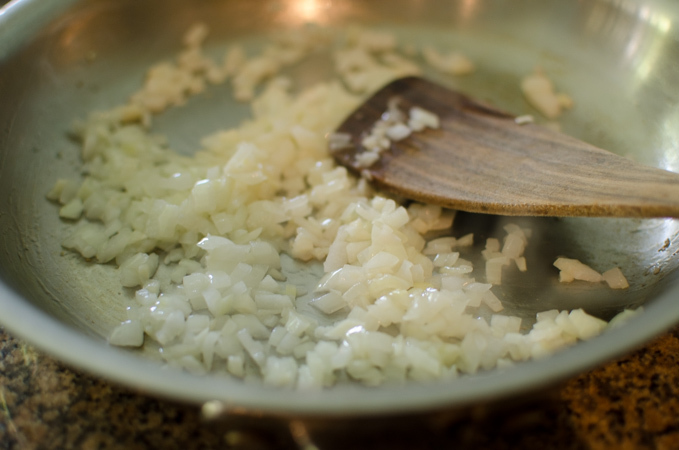 Saute onion and garlic in a little oil until soft. I added zucchini and tomato. Zucchini is optional. Add the tofu and stir. Pour chicken stock, about 1/2 to 1 cup depending on how liquidy you desire. Bring this to boil and cook until everything is softened, about 2 minutes. 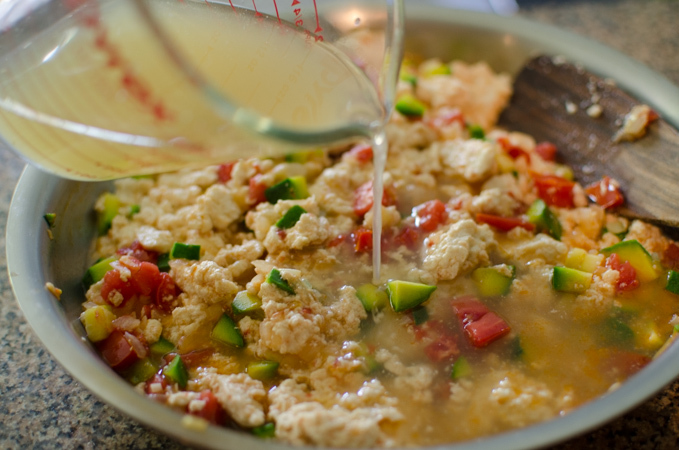 Drizzle the beaten eggs all over and stir well. Continue to cook until the eggs are set. Sprinkle some chopped green onion and toasted sesame seeds. The dish is ready to serve. I served with rice. FYI, the rice on the photo is mixture of plain rice, black rice and lentils cooked in a rice cooker. 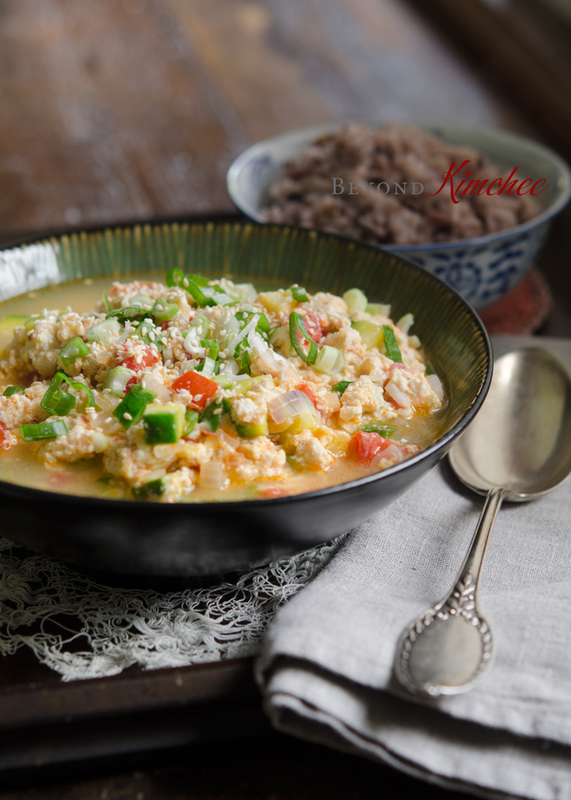 Try with kimchi on the side, and enjoy your comfort food anywhere you desire. Heat oil in a skillet and saute onion until translucent. 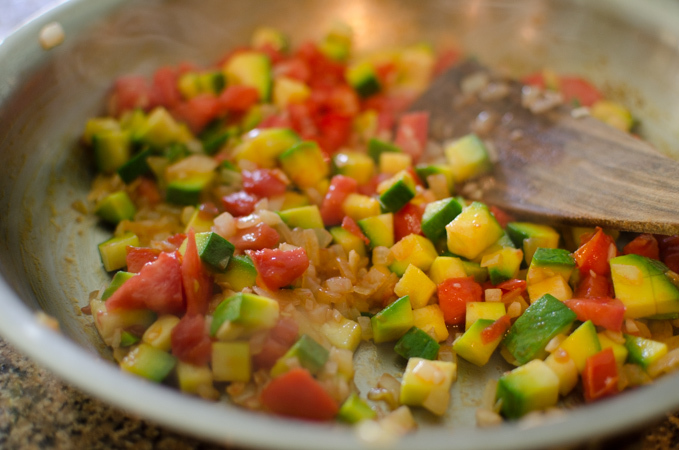 Add the zucchini and tomato and cook until soft. Season with salt. Add the tofu and the chicken stock. Use larger amount of stock if you want the dish to be looser. Let them boil over medium heat. 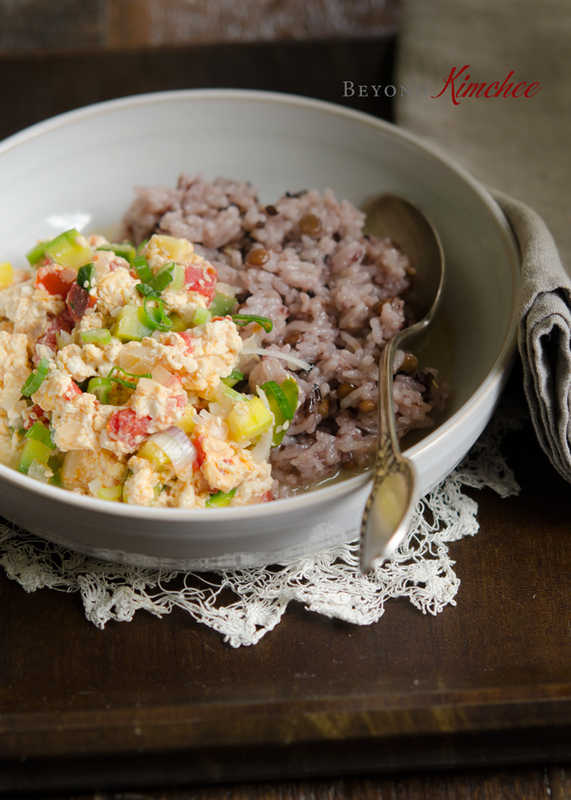 Drizzle the beaten egg over the tofu mixture and let it cook until the eggs are done, Sprinkle with green onion and toasted sesame seeds. Serve warm with rice. What an interesting dish. I've never had anything like it. It sure looks delicious! It doesn`t matter what the name is, because this dish looks amazing!! 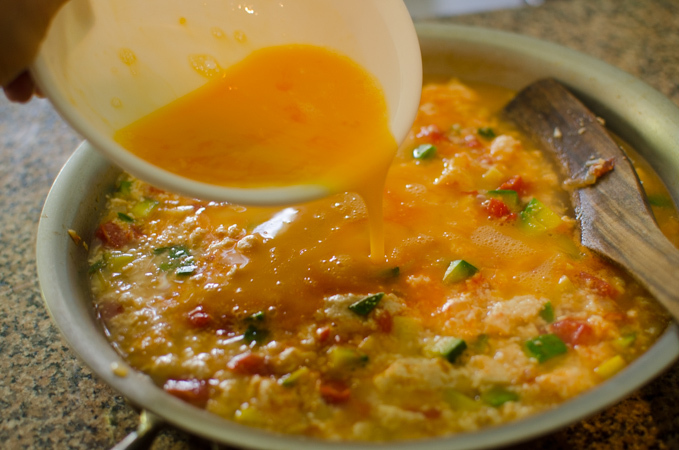 It looks similar to this Chinese tomato and egg dish that I love! What a happy dish! Fabulous colors, fabulous flavors and I've served it with quinoa instead of rice because we love quinoa MUCH! Quinoa is great to serve with. that would be very healthy choice. Thanks for the great idea!